Bridging the gap between digital currency and fiat is now possible through the Paycent App and the Paycent Card. You can withdraw and spend your digital assets at both local and international ATMs and stores using your very own Paycent Card. Cheers to that! 1. 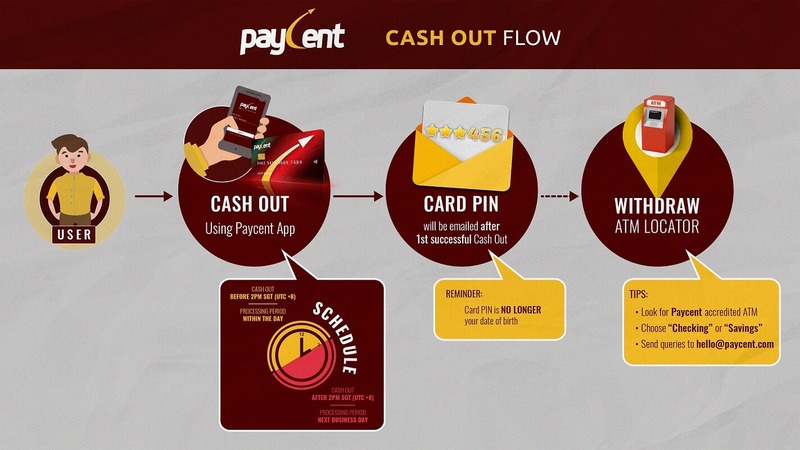 Your default Paycent Card PIN will be sent by email after 1st successful Cash Out. You may check your mailbox or SPAM folder. Paycent Card PIN is no longer your date of birth. 2. The Paycent App Cash Out requests will be handled by our team manually until the integration with the processing bank is completed. This is only a temporary solution for the next 30 days until the integration is completed. Once completed then everything will be back to real time 24/7. 3. Cash Out might take between 24-48 hours to be credited to your Paycent Card and you will be notified by email once the Cash Out is completed for spending and withdrawal. a. Paycent Card Cash Out requests will be processed only between Monday to Friday. b. Cash Out requests on or before 2:00 PM Singapore time would be processed within the same day. c. Cash Out requests after 2:00 PM Singapore time would be processed on the next business day. d. Please allow 24 to 48 hours before making a follow-up for any Cash Out concerns. 4. The Paycent Card fees structure has been updated on our website, paycent.com/paycent-card/. Please take time to check it out.